Blade and Soul Gold and SWTOR Credits had price severe drop in May from a similar reason, lacking of new interesting contents. World of Warcraft Gold was surprisingly lower than April although it just had beta testing for the upcoming expansion as well as the World of Warcraft movie. Tera was still doing well from its costume strategy. 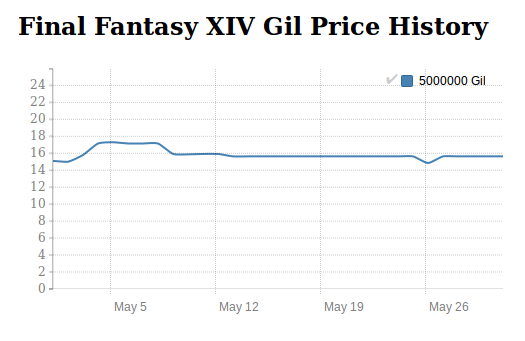 FFXIV Gil price was on a slight decline but expected to rise again soon whereas EvE Online ISK price was very stable. ArcheAge Gold price has been slightly increased thanks to the new patch update 2.9 Ascension. It brought many new features to the world of world of Erenor from new player nation system, building a huger castle, more powerful items, to new PvP systems. Although the 2.9 patch update did increase the RMT price, it should not be that significant. Gold price shouldn’t be higher than this even after the Ascension release. ArcheAge Gold price is expected to be slightly increased during the first 2 weeks of June and then back to its normal range again. The cheapest Archege gold was on May 14 2016, which is 2,000 ArcheAge gold for (US) $29.98 and the most expensive was on May 30, 2016, for $34.32. It is a 14.48% increase. Guild War 2 Gold price doesn’t change much from a previous month. It’s still staying in the rate of $11 USD per 500 Guild Wars 2 gold. Although its in-game currency price had a slight increase at the end of the month, it should not create any different in a long term. Looking at Guild Wars 2 news, it seems like there’s nothing new in the near future. The game just only brought new decorative items in the Gemstore. There’s still no new story, content, and features. However, the game is now more focusing on the Pro Leagues, bringing the top professional teams over the world to fight through the structured PvP leagues. And this season 2 has a prize pool of $400,000 USD. Guild Wars 2 can go back to its glory again if the Leagues go well. Guild Wars 2 Gold price should be higher in June especially after the season 2 final on June 25. The cheapest was on May 06, 2016 which is 200 Guild Wars 2 Gold for $10.39 and the most expensive was on May 31, 2016 for $11.99. There’s a slight 15.40 increase. SWTOR US Credits price surprisingly suffered serious decline in May. Its in-game currency price has been on the decrease after February and it was getting more serious in a previous month. It ended with $7.9 USD per 10mn credits, which is the lowest price ever for the SWTOR Credits price history. And it shouldn’t be surprised if the price will go down again in the months to come since people is now getting bored of the BioWare plan to release a monthly update for the KOTFE. However, SWTOR price still has a chance to be on a rise again after the expected full release of Knights of the Fallen Empire after August and even the Star Wars movie “Rogue One” in December. The cheapest was on May 31, 2016 which is 10mn SWTOR US Credits for $7.90 and the most expensive was on May 05, 2016 for $12.27. It was more than 55% decrease. WildStar released 1.5.1 update in the first week of May adding a new Vault of the Archon story to the game as well as some minor adjustments. It caused WildStar Gold to have a sharp 15% increase. However, its price was quickly dropped a few days after since there’s nothing much interesting in it. Since they belong to the same game publisher, WildStar Online used the same strategy as Guild Wars 2 by adding new items in the in-game store in order to boost some revenue during a hard time. However, this shouldn’t help much in a long term unless it can cooperate with other popular figures like what Tera is doing. WildStar Gold price is expected to be slightly increased in June because of the upcoming Starfall Celebration, a month-long celebration to the release of WildStar in June two years ago. 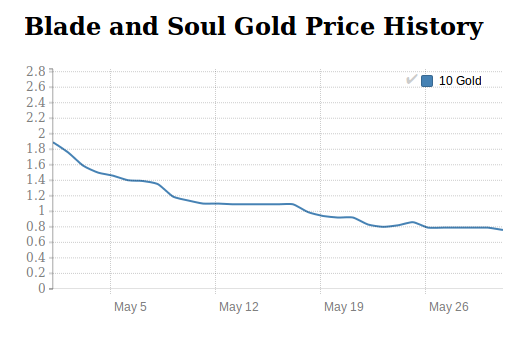 The cheapest was on May 276 2016 which is 5,000 gold for $34.95 and the most expensive was on May 10, 2016 for $49.40. The discrepancy rate was as high as 41.34% different. May is a busy month from the World of Warcraft: beta testing for the upcoming patch, “Legion”, cinematic the World of Warcraft movie, and the preparation to BlizzCon 2016. However, it’s quite surprised to see that the World of Warcraft Gold price didn’t change at all even though having 3 important events at the same month. Worse, an average price is even slightly lower than the previous month. However, it’s only two months to go until the release of the Legion. 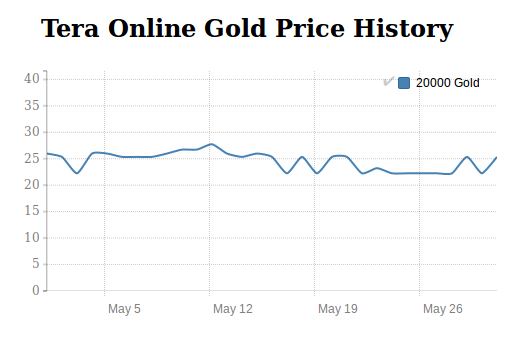 Enjoy the low WoW Gold price during this time until it has significant increase in August. The cheapest was on May 27, 2016 which is 50,000 gold for $16.34 and the most expensive was on May 05, 2016 for $19.37. It was 18.54% different.